My perennial, summer, flower gardens are beginning to show their beauty. Here are some of my favorite shots taken in the past two weeks. 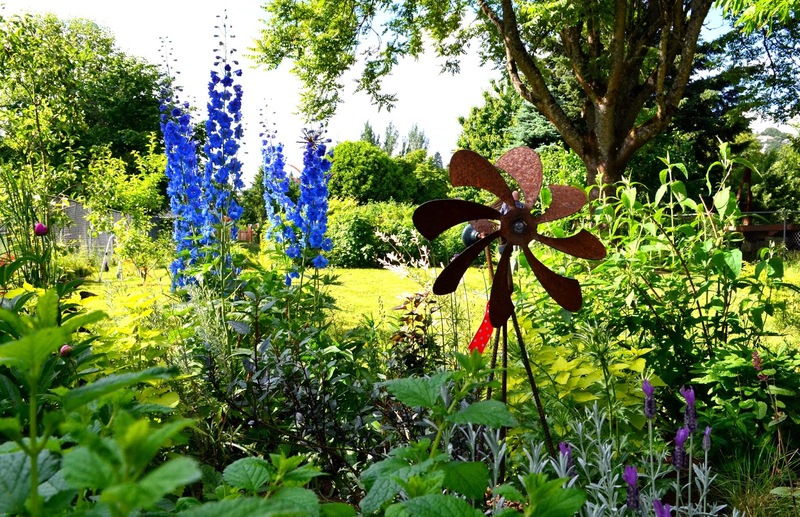 The blue delphinium take center stage in the late spring garden. They provide the perfect back drop for pretty pictures. I dug up my delphinium from our previous home and have since divided it. The rose pink peonies that I was given last year from my neighbor, are so fragrant and I find the pink and blue color contrast to invoke feelings of youthful bliss. 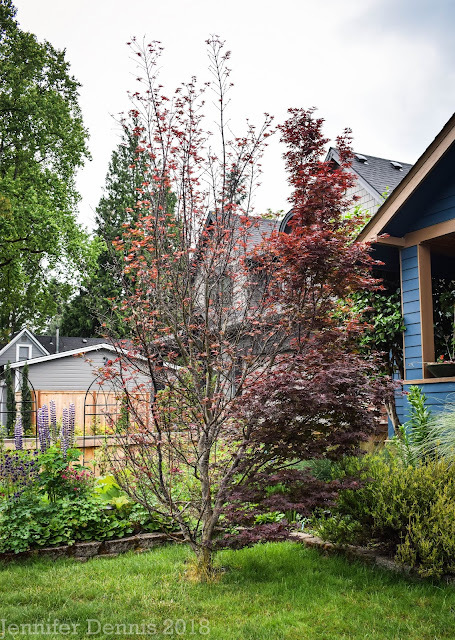 Some of my favorite plants have been shared with me by fellow garden bloggers or neighbors. This perfectly, pink, peony will be a happy staple in my garden for years to come. This year I did individually stake my delphenium and peony blooms. Next year I will seek out a decorative cage for my peony as the blooms still proved too heavy for the stakes when it rained heavily. After I visited the Kijktuinen gardens in the Netherlands last summer, I was absolutely smitten with Verbena Bonariensis. The designer had them scattered throughout many of the sunny, perennial beds and I have been determined to grow my own collection. They dance in the wind with the grasses and rise above many of the other emerging blooms. A perfect compliment. The June flower garden would not be complete without lavender. I grow about four varieties and have found for purely aesthetic purposes, Spanish Lavender is my favorite. The plants have a firm and upright shape and the foliage is coolly, silver. The fragrance is not overwhelming but has a soft, sweetness to it that gently floats. This is not a lavender that I dry for herbal or dried fragrant purposes, but as a staple in my perennial gardens, it has proven itself as it's keeps upright during heavy rain showers and has not suffered through hot summer days. What are some of your favorite flowers for a late spring garden? So nice to now be able to picture your whole garden in my mind's eye as I look at these pictures of loveliness. I so enjoyed the lovely selection of blooms you shared today. 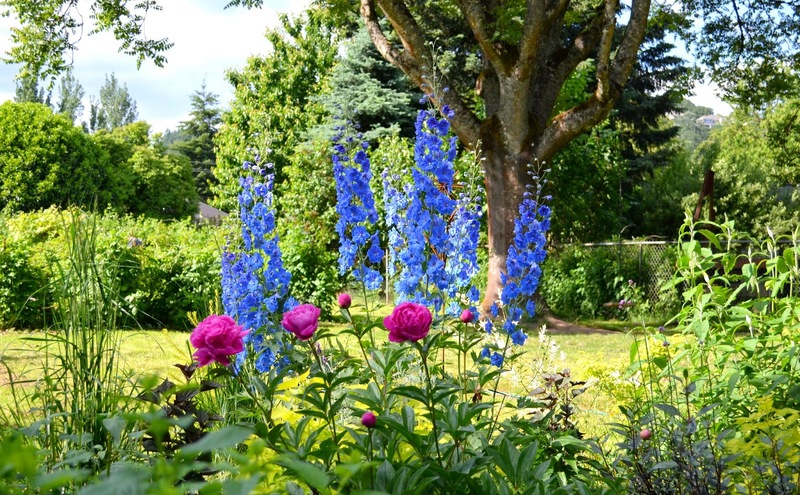 The blue Delphinium and rose pink Peony certainly do make a beautiful couple. Loved the Verbena and Lavender as well. 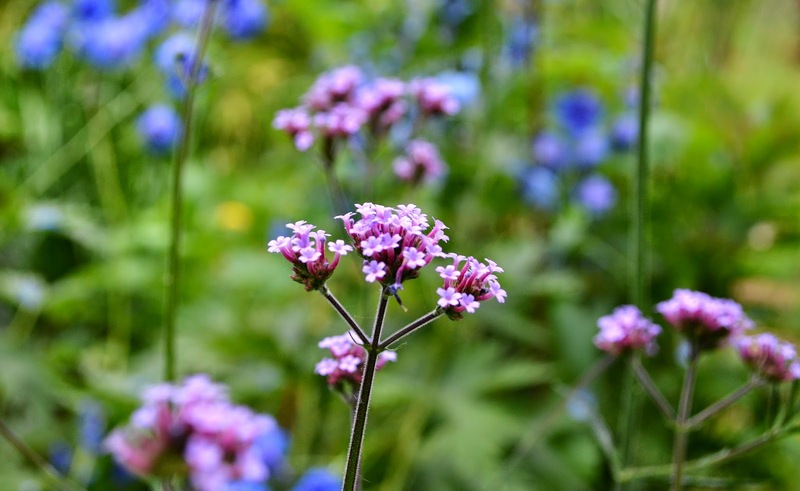 Maybe the verbena scatted itself, it does in our garden. I keep finding plants in the wrong places and dig them up and move them I really like blue and white campanula persicifolia st the moment. Delphinium, always beautiful ! That colour is a good backdrop to all kind of flowers. Enjoy them. I love Spanish lavender! 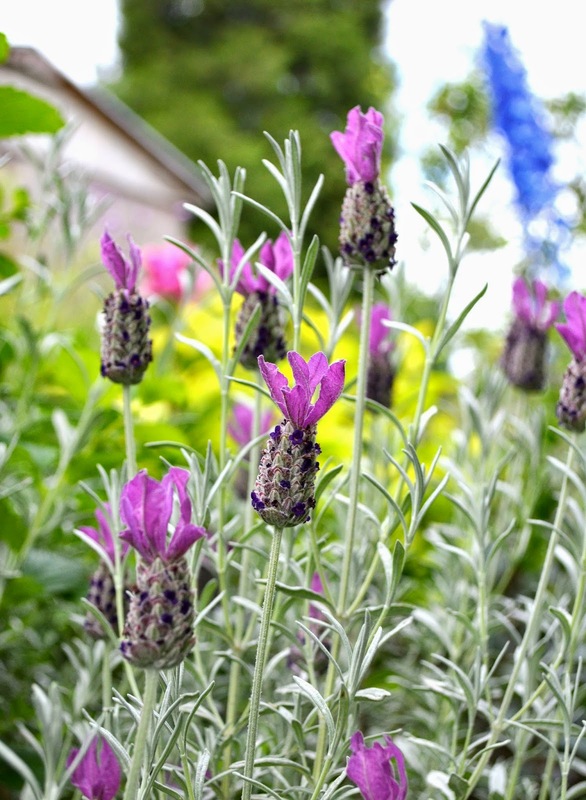 I find both the plant and flowers more attractive than other lavenders. But then I only grow lavender as an ornamental, not for other purposes. I'm thinking I could kick myself for getting rid of my bazillion seedlings of Verbena bonariensis. I'm regretting my haste. So pretty, as are your other beauties.